The near-collisions in recent weeks between Iranian Revolutionary Guards torpedo speedboats and US warships in the Persian Gulf look like harbingers of further Iranian belligerence – especially in conjunction with unusual developments in Tehran. DEBKA Weekly’s Iranian sources see Tehran gearing up to raise the stakes against America on four fronts, the Gulf, Yemen, Saudi Arabia and Syria. In a telling political event in Tehran, the hard-line Revolutionary Guards commander, Gen. Mohammad Ali Jafari suddenly turned up on Monday, July 24, at the door of his rival, the moderate President Hassan Rouhani to congratulate him on his election in May. The president almost fell out of his chair. For three years they have been at daggers drawn since Rouhani promoted the nuclear accord Iran signed with six world powers. Since then, the Guards accused him of granting disproportionate concessions for the deal, while Rouhani charged the Guards and their monopolistic grip on the economy with subverting the economic recovery offered by that accord. Nothing but the prospect of a violent confrontation with Washington and the need for national unity would have brought those two rivals together. 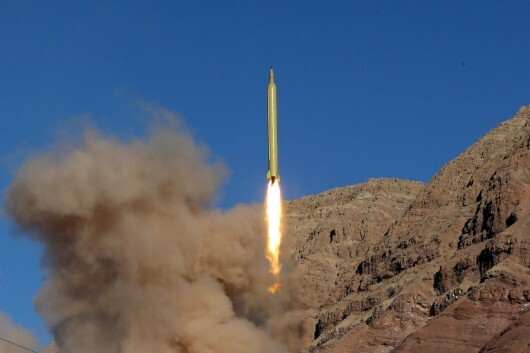 Exactly a week earlier, Tehran successfully tested the Simorgh (Safir-3) rocket capable of carrying a 250-kg satellite into orbit, after years of developing technology for mounting small nuclear warheads of ballistic missiles.This success followed many failed tests. US President Donald Trump reacted by signing a new round of sanctions that targeted six Iranian entities associated with the national missile program. On Tuesday, Aug. 1, Iran’s Majlis Speaker Ali Larijani hit back with the announcement that his government had complained to the UN Security Council that the new US sanctions were a breach of their 2015 nuclear accord, according to the verdict of the JCPCA supervisory body. This came on top of an Iranian media report Monday that President Rouhani would soon unveil the government’s reaction to US sanctions. It also followed a week in which the Trump administration prepared to assail Tehran’s compliance with the nuclear accord. First, Washington decided to demand more rigorous inspections than hitherto of suspicious Iranian military sites. Second, “serious flaws” in the epic accord were placed under a microscope. And third, the administration opened talks with fellow-European signatories on drafting a follow-up accord to prevent Iran going back to full-scale nuclear development when the 2015 accord expired in less than ten years. In focus is the Parchin military compound where Iran has long been suspected of conducting nuclear blast tests. A year ago, the International Atomic Energy Agency (IAEA) said it had reached agreement with Tehran to conduct inspections of this facility. This visit has yet to be allowed. If it is refused, Washington will have solid grounds for saying Tehran is in breach of the nuclear deal. Hamid Aboutalebi, a political adviser to Rouhani, said this week that the time had come for Tehran to form an international coalition against the United States. He said that the Trump administration would in any case find Iran in violation of the nuclear deal, because, he said, the US “does not attach much importance” to JCPOA supervision or IAEA verifications” and will make its decisions outside those bodies. Officials of the revolutionary Islamic regime are acting and speaking as though they have nothing to lose by going up against the Trump administration. They believe they can count on a large measure of quiet Russian support if they continue to challenge the Americans on key Middle East fronts in the Gulf, Yemen, Saudi Arabia and Syria.